The Chief guest for the Annual Prize Distribution Ms. Pallavi Dempo, trustee of Dempo Charities Trust seen addressing the gathering in the presence of Administrator of DCT’s Mr. Rajesh Bhatikar, Principal, Mrs. Rupa Khope, Vice Principal, Mrs. Rekha Gurrala, Students Council in Charge, Mrs. Aparna Dhawaliker and General Secretary, Mrs. Nikhil Verma. Best sports person:- Ms. Ayusha Bandiwdekar. Best Student Award in the Arts Stream:- Ms. Vibha Sidhaye. Outstanding Student in Academics:- Ms. Veronica J. Oliveira. Outstanding Student with Exceptional Qualities and Best NSS Volunteer (Boy) – Mast. Malu Gaonkar. 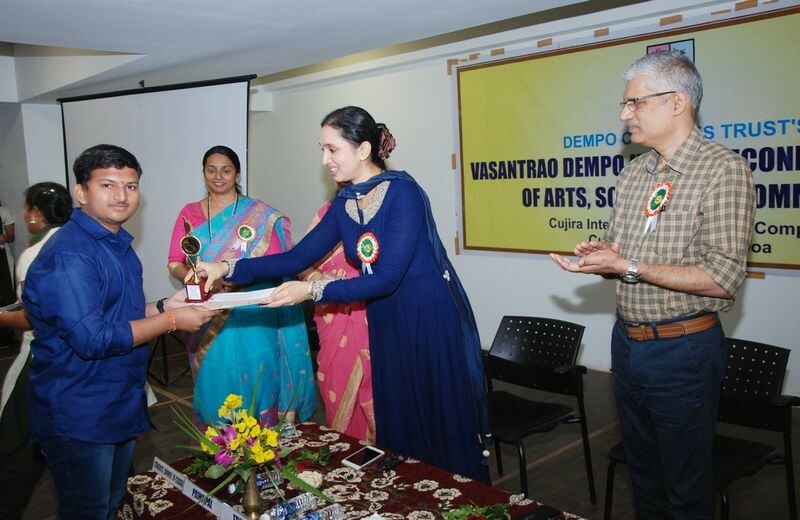 The ‘Annual Prize Distribution Ceremony 2018-19′ of DCT’S Vasantrao Dempo Higher Secondary School of Arts, Science and Commerce, Cujira – Santa Cruz was held on 31st January 2019 in the AV room of the school premises. 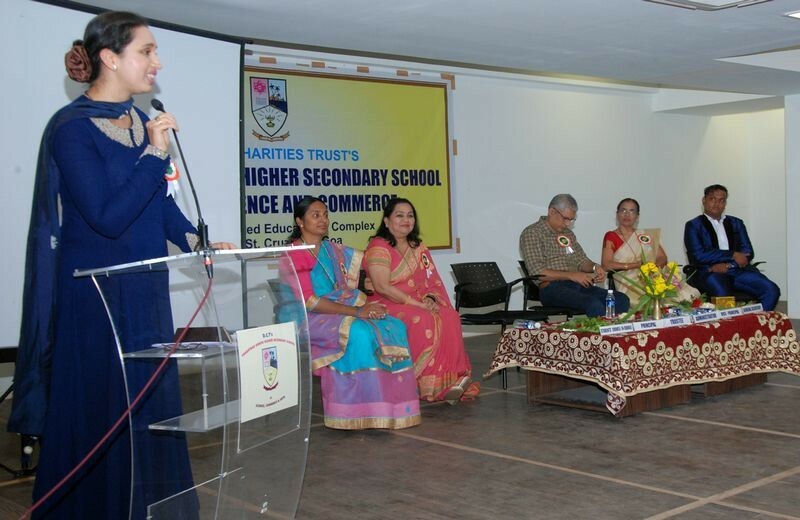 The Chief Guest of the function was Mrs. Pallavi Dempo, Trustee of Dempo Charities Trust. The other dignitaries on the dais included Administrator of DCT’s Mr. Rajesh Bhatikar, Principal, Mrs. Rupa Khope, Vice-Principal, Mrs. Rekha Gurrala, Students’ Council Teacher Incharge, Mrs. Aparna Dhawalikar and the Students’ General Secretary, Master. Nikhil Verma. The Chief Guest congratulated all participants on the occasion and encouraged everyone to become creative in this developing world. The administrator gave the welcome address in which he stressed that we should focus on becoming a progressive institution. 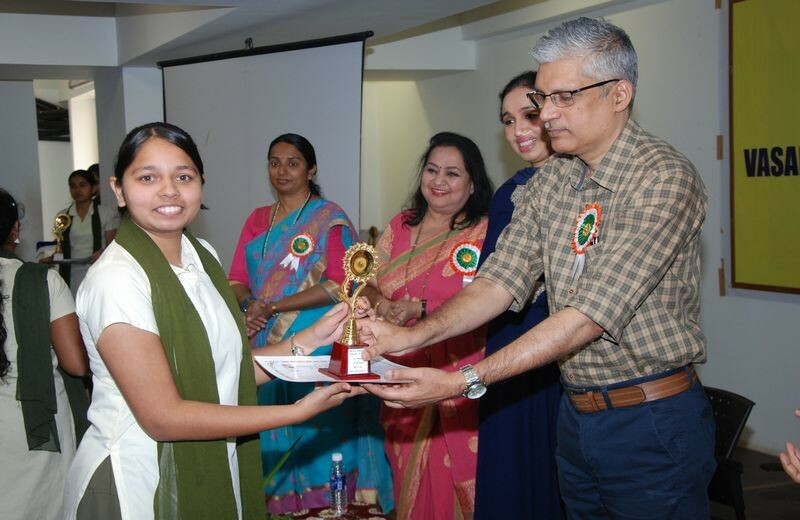 Special appreciation awards and cash prizes were given away at the hands of the Chief Guest to state, school and subject toppers of 2017-18 from class XII Science, Commerce and Arts. Miss. Saavi Natekar and Miss. 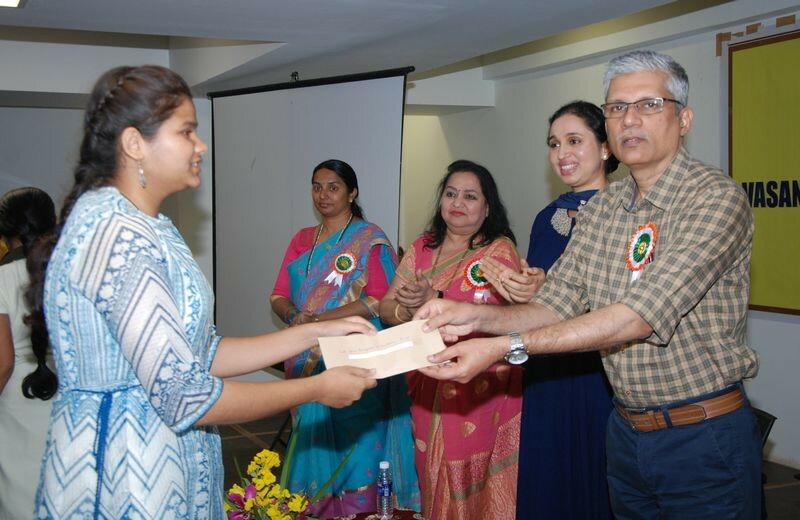 Shivani Bhide were felicitated for topping the Goa Board March 2018 Examination in the Science and Commerce streams respectively and Miss. Freeda Coelho was felicitated for topping the school in Arts stream. Students who topped Std XI in Science, Commerce and Arts streams during the academic year of 2017-18 were also awarded certificates and trophies. 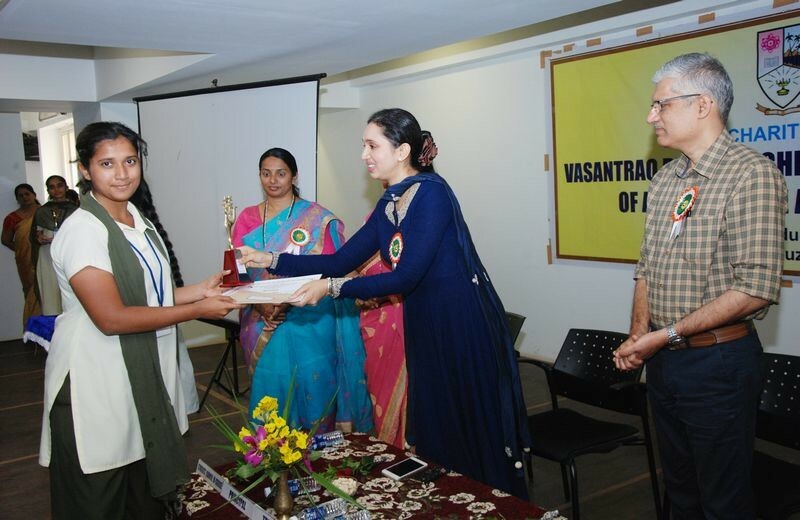 Awards and certificates were also given for ‘Best Student Award’ to Ms. Vibha Sidhaye, (Arts Stream), Mast. Sidhant Rao (Science Stream) and Ms. Gayatri Jha (Commerce Stream). The award for ‘Overall Outstanding Student’ was given to Miss Ryle James Ammagol and the award for ‘Outstanding in Academics’ was presented to Miss Veronica Jenoshka De Oliveira. Award for ‘Outstanding Student with Exceptional Qualities’ was given to Master Malu Gaonkar. The other awards for the day were the ‘Best Sportsperson Award’ that was presented to Miss Ayusha Bandiwdekar and ‘Best NSS Volunteer award’ (Boy and Girl Volunteer) was awarded to Master Malu Anil Gaonkar and Miss Naina Narvekar respectively. Earlier, the Principal read out the ‘Annual School Report of 2018-19’ highlighting the activities conducted during the academic year. Earlier, the Vice-Principal introduced the Chief Guest. The welcome dance was presented by Ranjitha R. Bangera from class XII Commerce D. The function ended with the ‘Vote of Thanks’ by General Secretary, Master Nikhil Verma. The comperes for the programme were Tr. Shubhada Bandodkar and Tr. Edna Da Costa.